I've wanted to make this dish since I first saw it on the cover of the March issue of the Food Network Magazine. The article is titled, "11,375 Stir-Fries," and it offers a five step recipe to create, well apparently, that many different dinners. First you pick your protein. Could be beef, pork, shrimp, chicken or tofu. Then you marinade your chosen protein, prep 3 cups of vegetables in any combination, and choose from one of five sauces. The secret of a good stir-fry is making sure everything is prepped before hand. Because once it's time to actually cook, it all goes pretty quickly. 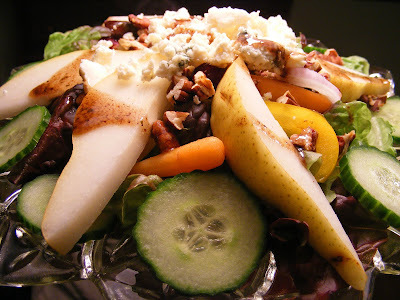 Add a nice winter salad with baby greens, pears, yellow peppers, cukes, red onions, toasted pecans and gorgonzola. Drizzle with a maple balsamic dressing and you are in veggie and flavor heaven. For marinade, whisk egg white, sherry and cornstarch. Toss with shrimp, cover and refrigerate for one hour. Prep veggies. For sauce mix all ingredients together. Drain excess marinade from shrimp and place all ingredients near stove. Heat 4 tablespoons olive oil in wok or skillet over medium high heat. Add shrimp and for about three minutes until both sides are pink, turning once halfway through. Remove from pan. Add 1 - 2 more tablespoons of oil to the pan and heat add the garlic and ginger. Stir-fry for about 30 seconds. 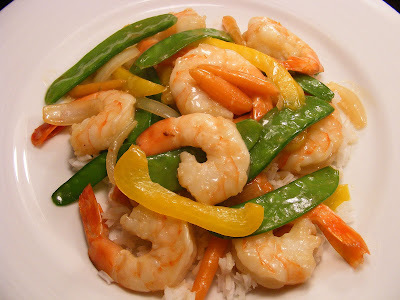 Add the vegetables in order starting with the ones that take the longest to cook and stir-fry until crisp tender. Add the shrimp and the sauce and stir until the sauce is thickened and the shrimp is heated through, about 3 minutes. How easy is this!!! Very nice and it looks beautiful! I love the Food Network magazine! And I love the stir-fry you created - delicious! Recipes for the maple-balsamic dressing? Sounds wonderful!